The desire to cut down all eucalyptus on UC property in the East Bay hills ignores the tree's beauty and recreational value. 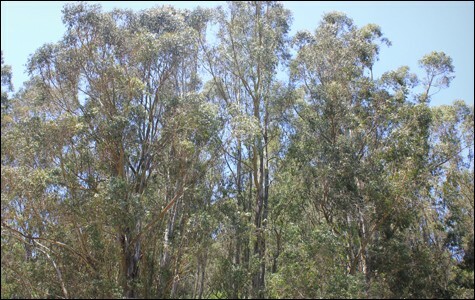 Eucalyptus have been part of the California landscape since the 1850s. Gregory Davis is a Berkeley resident. The debate over clear-cutting tens of thousands of non-native trees in Strawberry and Claremont canyons and periodically dousing the area with a herbicide chemical to reduce fire risk seems to boil down to two sets of protagonists. 1) The Single-Minded Clear-Cutters. On one side is the University of California's environmental policy advisers, who advocate a drastic, meat-axe approach of clear-cutting non-native trees, primarily Monterey pines, blue-gum eucalyptus, and acacia, followed by periodic chemical application of the herbicide Roundup for ten years in an effort to prevent the reappearance of non-native species. They are seconded by the Claremont Canyon Conservancy, a local homeowners' group united in their opposition to non-native plants. This aversion is directed at the Monterey pine (considered non-native, evidently, because it was originally found on the central California coast) and the French broom (a beautiful plant with yellow flowers and a delicate fragrance, associated with an exaggerated claim that it will crowd out native shrubs and take over the hillside), but the blue gum eucalyptus is undoubtedly a primary target of their disapproval. 2) The Balanced-Approach Pragmatists. On the other side of the debate over clear-cutting and chemical treatment as a fire-risk-reduction measure is the East Bay Regional Park District, also supported by a local group, the Hills Conservation Network, both of which advocate a more reasonable selective removal and thinning of some non-native trees. UC, the park district, and the City of Oakland have jointly applied for a $5.6 million grant from FEMA for the cutting 0f a total of 80,000 trees in the East Bay hills — money that ensures that some kind of tree-cutting project will become a reality. Does the zealous aversion to the "non-native" plant of the clear-cutters have some of the same snob appeal as that of Californians who drive smugly around with a "native" bumper sticker on their car, meaning they or their descendants came to our state before more recent immigrants from Asia or south of the border? In the case of trees, should one have to be a native Californian with roots in the Gold Rush days before he or she can disdain a tree like the eucalyptus, which has been here ever since the Australians brought the seeds into California in the 1850s? I have lived in California for almost eighty years, and for me a tree such as the eucalyptus, with all its beauty and majesty, has been a "given" of its natural environment. Until recently, no one ever informed me that its Australian point of origin conferred upon it an inferior status. Furthermore, nature everywhere is a dynamic entity, with climate change providing only one example of how plant and animal species move, sometimes very rapidly, from one geographic area to another. Other dynamic forces include genetic mutations and evolutionary processes, transport by air and ocean currents, effects of disease epidemics, natural disasters and cataclysms, human migrations, technological interventions and side effects, wars, etc. A fellow traveler with the eucalyptus-hating clear-cutters is the chairman of the Sierra Club's East Bay Public Lands Committee, who promotes the elimination of non-native species, not only for dogmatic reasons of principle (yes, "cleansing" our state of non-native plants seems to be an environmentally correct absolute for some), but also in the case of the East Bay hills because it allegedly would be a more "cost-effective" method of fire-risk reduction in the longer term. Like a corporate manager, he wants us to accept that a quantitative standard should be the overriding consideration, which, like the bottom line, would trump quality of life factors like recreational use and aesthetic value. In the background of this controversy is the memory of the dramatic 1991 fire in the Oakland hills, although it is significant that none of the trees in the Claremont Canyon area, including the lovely eucalyptus grove at the southeast corner of the Clark Kerr student residence facility, burned. This entire debate, it should be noted, is based on the claim of the clear-cutting advocates that the eucalyptus, along with other non-native species like Monterey pines, of which there is a beautiful stand on the ridge at the top of the Claremont Preserve trail — which begins in the eucalyptus grove — pose a greater fire risk. Judging from the letters on this tree-cutting in the pages of the Express, however, forest management experts disagree on the level of fire risk and the type of cutting most appropriate for a non-native species like the eucalyptus. It also appears that the quantitative level of risk for an area like the Claremont Canyon eucalyptus grove was exaggerated by including it in a global East Bay Hills average, which included more distant high-burn areas and the figures for the disastrous fire of 1991. The idea of treating with a chemical herbicide like Roundup an area in which tens of thousands of trees have been clear-cut in order to inhibit the return of non-native natural species is another egregious example of a single-minded approach. Perhaps its brutal simplicity and pretense of finality will appeal to FEMA bureaucrats thousands of miles away, not to mention the university's Environmental Projects decision-makers. It is significant, however, that, in recent years, the university has successfully kept the growth of underbrush in the eucalyptus grove and grassy hillside opposite it by using natural, rather than chemical, means — i.e., by periodically bringing in a herd of goats from the Central Valley to eat all the brush, debris, and tall grasses. Chemical treatment of the hills for a period of years, in any case, is tantamount to opening a can of worms. Who knows exactly what new problems this approach will create? What, for example, will be the unintended or unforeseen effects of the chemical on predator or parasite bugs, reptiles, and birds that keep the number of other undesirable insects or other animal populations — gophers, for example — under control? Will certain animals in the food chain, such as birds, be deprived of a food source? In addition, will there be a greater runoff of water — and even flooding — during the rainy season in the absence of the trees, which previously moderated downhill drainage during storms. And will residues of chemical(s) applied infiltrate residential gardens, where household pets may be affected adversely or insect pests may unexpectedly proliferate? If there is such an increase of unwanted bugs, a pesticide application may be ordered by the forest management experts in the hills, thus triggering a new sequence of unforeseen and undesirable events. In other words, dousing the clear-cut East Bay hills with chemicals may trigger ecological imbalances that produce chain effects for years. Not surprisingly, the affinity of policy makers and bureaucrats for chemical applications with serious harmful side effects has its antecedents in US and California history, including the aerial spraying of Agent Orange (dioxin) in the 1960s to defoliate the jungle canopy where enemy forces might have been hiding along the northern border of South Vietnam, and the helicopter dosage of suburban areas in California counties in 1987 with the pesticide Malathion to combat the Mediterranean Fruit Fly. Agent Orange brought cancer and serious health disorders to American GIs in the area, and thousands of Vietnamese children in chemical-treated locations were born with horrible birth defects. An unintended side effect of the Malathion spraying in the California suburbs was respiratory problems for humans, particularly children, in affected areas. My most personal concern, besides that of preventing the brutal clear-cutting and chemical treatment approach, with its radical implications for the East Bay Hills for years to come, is the preservation of the eucalyptus grove at the southeast end of the Clark Kerr campus. 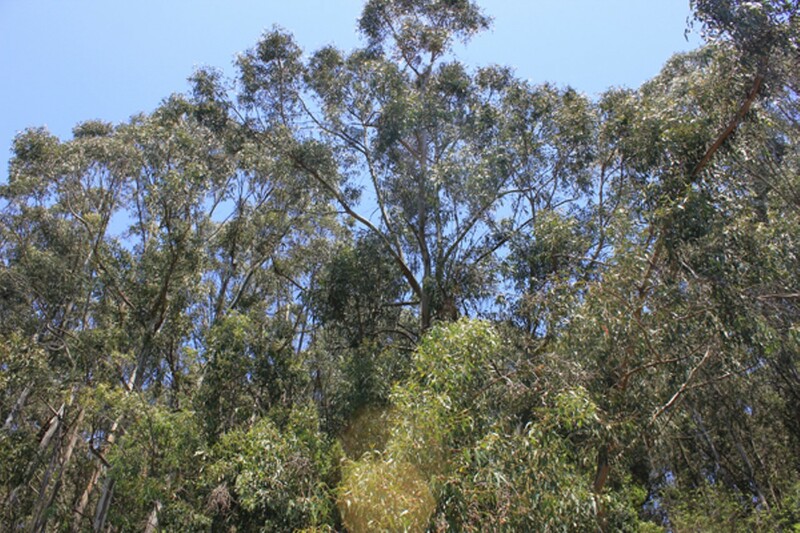 It is a perfect example of any area where the eucalyptus have flourished in California and contributed significantly to the quality of life in our community. Clear-cutting the grove would ignore the value of the trail for the hikers, dog-walkers, students, teenagers, young families, and the old strollers who frequent the grove, not to mention visitors who marvel at the beauty of the setting and the enjoyment of the experience. Anyone who has hiked up the trail under the green canopy of these tall, stately, plumed-top, evergreen trees knows how precious they are. In 1904, Alfred McClatchie wrote of the eucalyptus trees of California: "Without them, landscapes now varied and softened by their presence would be comparatively monotonous and unattractive." In many instances, their presence has fulfilled this promise. Over the years, they have been planted in public parks and municipal squares, on beaches, in schoolyards, on university and college campuses, on the edges of agricultural fields to shield sun and wind, as borders of private properties, and to bring greater beauty to the landscape in other settings. For me, the eucalyptus is part of California. Let us hope that the fire risk in various parts of the East Bay Hills will be assessed individually and not globally, and that we will be spared the brutal and simplistic approach of the area-wide clear-cutting and chemical treatment favored by the single-minded experts, administrative bureaucrats, and native-plant dogmatists. The alternative of a denuded, stump-ridden, chemical-treated hillside — the product of human efforts to create artificially a native-plant-only segment of nature — requires that one accept the native plant standard as an absolute value, a dogma never to be sacrificed or modified to accommodate other important considerations. A more intelligent and balanced approach would avoid exaggeration of fire risk and seek to balance quantitative criteria like cost effectiveness with quality-of-life factors such as beauty and recreational value. This would require an effort to preserve eucalyptus and Monterey pines where possible, including the Clark Kerr-adjacent Claremont eucalyptus grove and the Monterey pines at the top of the trail.